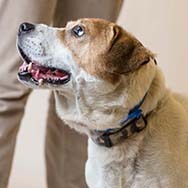 Obesity is an extremely common problem in dogs and, as with humans, can be detrimental to their health. Many guardians think their pudgy dogs are adorable, when in fact they are very unhealthy. The overweight dog has many added stresses upon his body has an increased risk of developing diabetes, liver problems and joint pain. Obesity develops when energy intake exceeds energy requirements. The excess energy is then stored as fat. Once a dog is obese, he may remain obese even after excessive caloric intake stops. The majority of cases of obesity are related to simply overfeeding, coupled with lack of exercise. 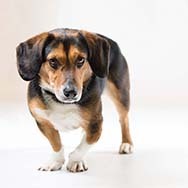 Certain groups of dogs appear more prone to obesity than others. Specific breeds (Labrador Retrievers and Pugs, for example) and older dogs are particularly prone. Is your dog a hog? As a subjective assessment of body condition, you should be able to feel the backbone and the ribs in an animal of healthy weight. If you cannot feel your dog’s ribs without pressing, there is too much fat. Also, you should see a noticeable "waist" between the back of the rib cage and the hips when looking at your dog from above. Viewed from the side, there should be a "tuck" in the tummy—the abdomen should go up from the bottom of the rib cage to inside the thighs. Dogs who fail these simple tests may be overweight. Correct Diet: Overweight animals consume more calories than they require. Work with your veterinarian to determine your dog’s caloric requirements, select a suitable food and calculate how much to feed. The diet should contain a normal level of a moderately fermentable fiber and the type of fat that prevents the skin and coat from deteriorating during weight loss. Diets that dilute calories with high fiber lead to increased stool volumes, frequent urges to defecate and variable decreases in nutrient digestibility. Treats: We all love to give our dogs treats. However, treats should be given in moderation and should represent five percent or less of the dog’s daily food intake. The rest should come from a nutritionally complete dog food. When using treats frequently, such as during training exercises, try to use the smallest pieces you can. Exercise: Increasing physical activity can be a valuable contributor to both weight loss and maintenance. Regular exercise burns more calories, reduces appetite, changes body composition and will increase your dog’s resting metabolic rate. Guardian Behavior Modification: A successful weight management program requires permanent changes in the behaviors that have allowed the dog to become overweight. Perhaps you are giving your dog too many treats, for example, or not giving him enough opportunities to exercise. Remove your dog from the room when the family eats. Feed your dog several small meals throughout the day. Feed all meals and treats in the dog's bowl, in an enrichment toy, or during training.